Five years ago today, an explosion at BP's Deepwater Horizon drilling rig in the Gulf of Mexico killed 11 people and caused the release of 130 million gallons of oil into the sea. 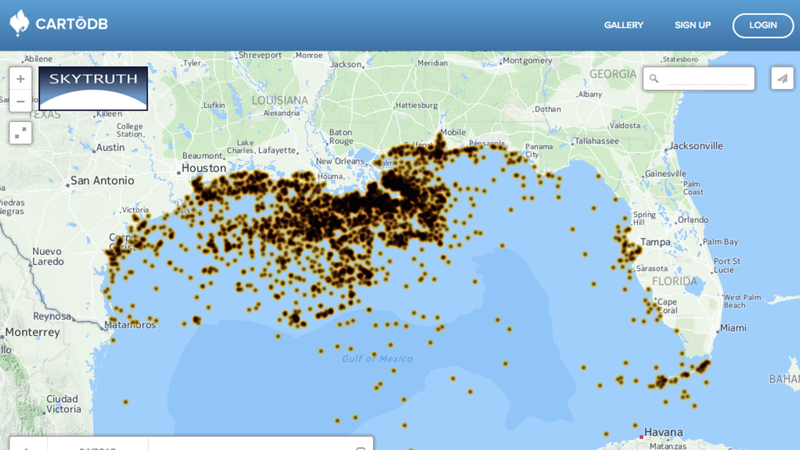 To mark the occasion, SkyTruth, a nonprofit group that uses publicly available satellite images to document environmental incidents — and which broke the story that the BP spill was much worse than anyone thought — has released a map showing every oil and hazardous materials incident in the Gulf reported to the National Response Center since Deepwater. There have been nearly 10,000. While many of these incidents are minor, SkyTruth's David Manthos writes that it's instructive to compare the pollution reported in the waters off Texas and Louisiana with the reports made in the waters west of Florida, where there are many boats but no oil platforms. "Florida has far fewer pollution reports – not because they drill more safely or don't report to the NRC – but because there aren't any producing offshore oil wells in the eastern Gulf of Mexico." Bob Bea, a University of California-Berkeley civil engineering professor emeritus and and a former Shell executive, told the Miami Herald Sunday that new regulations installed since Deepwater don’t go far enough. SkyTruth says it has more data about volume on the way. The group was also instrumental in a new Associated Press report on a decade-old oil spill that has never been capped. The report caused the U.S. Coast Guard to increase its estimate of the amount of oil released from the leak by 20x. Earlier this year, the Obama administration proposed opening up large stretches of federal water on the Atlantic Coast Line, and parts of the Gulf of Mexico, for new offshore drilling leases. The proposal likely won't be finalized until at least next year.